Nutella is hard to resist, but it can be difficult to come up with new ways to use the delicious chocolate hazelnut spread besides, well, spreading it on things like muffins and toast. I never really tire of having velvety Nutella on toast, but a little change of pace is always a good thing – especially when that change of pace involves coffee. I stirred some Nutella into a cup of hot coffee and was impressed with the way the chocolate and hazelnut flavors blended with my dark roast. I played around with the combination until I had a delicious drink, then I topped it off with some Nutella whipped cream to boost the flavor even more. The Nutella whipped cream is made by dissolving Nutella into a small amount of hot coffee (water or milk would work, too), then folding it in to whipped cream. You need to dissolve the Nutella first because it is really far to thick to easily fold into the cream, and simply heating the Nutella would make it so warm that the whipped cream would deflate when you combined the two. The cream is incredibly decadent, like a very soft Nutella mousse. It is hard to resist not simply eating it with a spoon, but it really does finish off the coffee perfectly. If you’re looking for shortcuts, I should mention that you can actually used canned whipped cream to make this drink. I prefer to use regular heavy cream and just whip it up, but you can whisk the melted Nutella mixture right into the canned stuff (it doesn’t fold in and must be whisked quite vigorously), too. If you’re going to go this route, keep in mind that you’ll need plenty of whipped cream to achieve the right consistency (just keep squirting more in) and that the whipped cream will deflate much faster than heavy cream that has been whipped. In a large mug, whisk or stir together hot coffee, 1 1/2 tbsp Nutella, cocoa powder and sugar. Add more sugar to taste, if needed. Whip heavy cream to soft peaks in a small bowl. In another small bowl, place remaining tablespoon of Nutella. Add 1 tsp of the hot coffee mixture to the Nutella. Whisk together until Nutella has dissolved. 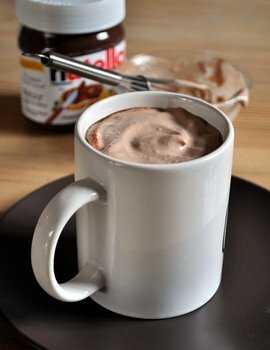 Fold Nutella mixture into the whipped cream and spoon it on top of the hot coffee.